Audio problem: 1897: Quentin challenges Barnabas by pulling a decorative sword from a wall display and pointing it at his throat. Unfortunately, the display wasn't all that well attached to the set wall. Though the camera pans away, you can hear a loud clunk as the piece falls, followed by the loud crash of shattering glass as it strikes and breaks a table lamp. You can also see the actors struggling very hard to keep straight faces as they continue with their lines. Other mistake: 1795: Reverend Trask is attempting to perform an exorcism when a (demonic?) fly aims straight for his mouth. He has to interrupt his incantation long enough to blow it away. Revealing mistake: 1967: Barnabas and Vicky are talking in Collinwood's foyer when a great deal of noise starts interrupting the scene from backstage. You can hear coughing, several bumps and crashes, shouts, and finally, a fire extinguisher going off. Meanwhile, the distracted actors are completely blowing all their lines - but the unstoppable taping goes on. Other mistake: 1967: A persistent fly insists on clinging to Barnabas' forehead as he plots to kill Dr. Hoffman. He tries to ignore it, tries walking briefly out of camera range, then comes back and tries shooing it away on camera, but it keeps coming right back. Visible crew/equipment: Episode 1065, year 1995. The shadow of a boom mike against the wall is visible as it rises out of the scene when Barnabas and Julia exit the room. Revealing mistake: 1968: When the psychic enters Quentin's haunted room, she stumbles over the wire used to "ghostly" open the door, and has to grab onto the gramophone table to keep from falling. The table almost falls over with her, but she manages to stay upright, barely. Other mistake: 1967: Burke mangles his line to Vicky, and instead of telling her to get off her history kick, says, "I just think you should get off that hickory stick for a while." Other mistake: 1968: The now-vampire Angelique kneels beside Barnabas' chair to tell him he belongs to her now. When she tries to get up, her long white gown catches on something, causing her to muff her next line a bit as she gives the fabric an annoyed tug to free it. 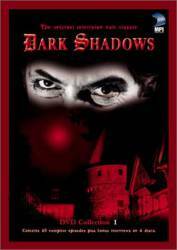 Revealing mistake: When "Dark Shadows" did its version of "Dr. Jekyll & Mr. Hyde," the Hyde character, John Yaeger, had prosthetic nose trouble during a fight scene. His rubber schnoz came unglued and nearly fell off. He was subsequently given a nose job. Revealing mistake: 1967: The apparently miscued Burke enters the foyer set through a door and starts across the stair landing. You can then hear the director say, "Try it again," and he turns, goes back out the door and comes in again. Revealing mistake: 1966: Elizabeth is thwarted by a set door that refuses to open when she tries to make her exit. She struggles with it, tugging several times, but winds up just standing there, exasperated, until the scene ends a few merciful seconds later. Continuity mistake: 1967: Barnabas selects a treasure from a jewelry chest while bad guy Jason spies on him through a window. Willie is supposed to put the chest away, but when Jason later breaks in to steal it, the chest is still sitting on the table in plain view, so Jason has to pretend not to notice it. The break-in scene is recapped the next day, only this time, the chest is no longer on the table. Visible crew/equipment: 1795: Angelique throws open a set of double doors to find Jeremiah's ghost in the hall. She cries out and steps back, and to the right of the screen, you can see a crew member's hand enter the shot to pull one of the doors open further. Revealing mistake: 1970: When the sheriff knocks, Jeb opens the antique shop door and the jangling shop bell falls off and crashes to the floor. They pretend that nothing happened and go on with their lines. Revealing mistake: 1967: Dr. Woodward struggles with a stuck zipper on an oxygen tent. When the prop refuses to cooperate, he makes a disgusted sound and adlibs to his companion, "Zip that up, will you, Julia?" Then he hurries out, leaving a bewildered Julia to deal with a supposedly critical patient. Other mistake: 1969: David blunders his line to Cousin Amy: "Don't feel too bad, Amy. I don't like to feel my relatives, err, I don't like to see my relatives." Visible crew/equipment: 1967: During the closing credits, a crew member walks by outside the supposedly-second-story window of Josette's bedroom - twice. Revealing mistake: 1897: Quentin walks away from Trask and exits through the door under the stairs. Unfortunately, that door was undersized, and David Selby was 6'2" tall. Quentin bangs his head on the doorframe hard enough to produce an audible thump. Revealing mistake: 1967, episode 86: Roger is late for a meeting because actor Louis Edmonds, forgetting he had another scene, had gone to his dressing room and undressed. Because it was "live tape," the other actors had to awkwardly ad lib until Edmonds could throw on a shirt and be hustled onto the set, whereupon one camera zoomed in tight on him and stays there for his solo shot making a toast. You can hear the stress in the other actors' voices as they stifle laughter. They're trying to play an oh-so-serious scene with an actor wearing a shirt, a tie, and boxer shorts. Angelique: Let me give you one word of advice, Dr. Hoffman. The pursuit of Barnabas Collins can lead to nothing but misery. He is a cold, harsh, unresponsive man." Dr. Julia Hoffman: Who made him that way? A prominent first-season character, Burke Devlin was originally portrayed by actor Mitchell Ryan. However, Ryan was abruptly fired from the show in 1967 due to his alcoholism. Actor Anthony George assumed the remainder of the role until Burke Devlin's death (in a plane crash) in 1968.